صادقی فر, طیب. (1396). پیش‌بینی نرخ انتقال رسوب موازی ساحل با استفاده از شبکۀ عصبی مصنوعی در خزر جنوبی (ساحل نور). نشریه علمی - پژوهشی هیدروفیزیک, 2(2), 91-107. طیب صادقی فر. "پیش‌بینی نرخ انتقال رسوب موازی ساحل با استفاده از شبکۀ عصبی مصنوعی در خزر جنوبی (ساحل نور)". نشریه علمی - پژوهشی هیدروفیزیک, 2, 2, 1396, 91-107. صادقی فر, طیب. (1396). 'پیش‌بینی نرخ انتقال رسوب موازی ساحل با استفاده از شبکۀ عصبی مصنوعی در خزر جنوبی (ساحل نور)', نشریه علمی - پژوهشی هیدروفیزیک, 2(2), pp. 91-107. صادقی فر, طیب. پیش‌بینی نرخ انتقال رسوب موازی ساحل با استفاده از شبکۀ عصبی مصنوعی در خزر جنوبی (ساحل نور). 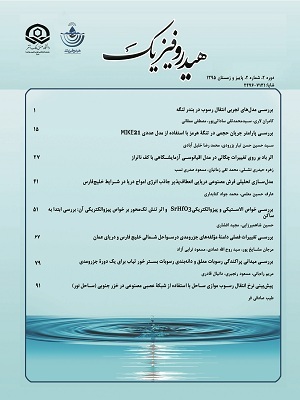 نشریه علمی - پژوهشی هیدروفیزیک, 1396; 2(2): 91-107. محاسبۀ نرخ انتقال رسوب موازی ساحل به‌منظور مطالعۀ دقیق الگوی فرسایش و رسوب‌گذاری، از جمله مهم‌ترین موضوعات در مهندسی سواحل است. در پژوهش حاضر، نرخ انتقال رسوب موازی ساحل از اول فروردین ماه تا آخر تیرماه سال 1391 با استفاده از تله‌گیر ستونی معلق به‌صورت روزانه اندازه‌گیری (سواحل شهر نور، در شمال کشور ایران) شد. روابط تجربی موجود عمدتاً براساس روش‌های برازشی بر روی داده‌های مشاهداتی و اندازه‌گیری‌شده ارائه شده است. نتایج استفاده از فرمول داک 85 نشان داد که نرخ انتقال رسوب برای ساحل شهرستان نور برابر با 334340 متر مکعب بر سال است. در مرحلۀ اول شبکۀ عصبی مصنوعی با متغیرهایی که با روش تجزیه و تحلیل عاملی به عنوان متغیر مستقل انتخاب شده بودند، اجرا شد. نتایج نشان داد که در مجموع عملکرد شبکه با تابع انتقال تانژانت هیپربولیک بهتر از سیگموئید بوده است. بهترین شبکه، شبکه‌ای با ورودی‌های ارتفاع موج شکنا، عرض منطقۀ خیزآب ساحلی، سرعت جریان در امتداد ساحل و نرخ انتقال رسوب به دست آمد. یک پارامتر خروجی (Q) به‌عنوان یک شبکه، منجر به پاسخ قابل قبول‌تر و قابل اعتمادتری با حداکثر مقدار ضریب تبیین 96/0 برای پیش‌بینی نرخ انتقال محاسبه شد. به این ترتیب با استفاده از شبکۀ عصبی مصنوعی ارائه‌شده در این پژوهش می‌توان به برآورد دقیق‌تری از نرخ انتقال رسوب موازی ساحل پرداخت. The estimation of alongshore sediment transport rate (LSTR) is the most important factor in analyzing the amount of erosion or accretion along a coast. In the present research, an LSTR measurement was done at daily intervals using sediment traps in Noor coastal area, north of Iran, from March 21 to June 22, 2012. The existing empirical relations are linear or exponential regressions based on the observations and measurements data. Based on calculations, the yearly average of sediment transport rate is 928.73 (m3/day) for Noor coastal area. One of the most widely used methods for estimating LSTR, which has advantages compared with others, is setting up and application of an artificial neural network (ANNs) and the present study attempts to develop such a model. Different ANNs with different input configurations and transfer functions were examined. The results reveal that usage of the hyperbolic tangent is better than application of the sigmoid as the transfer functioning. Moreover, the ANN with wave breaking height (), surf zone width (W), and alongshore current velocity (V), as inputs and sediment transport rate (Q) as output configures the best model and predicts more reliably, with higher correlation coefficient, R2, of 0.96, the L.S.T.R among others. Using the ANNs model presented in this research, therefore, the sediment transport rate can be estimated with sufficient accuracy. Kabiri-Samani AR, Aghaee-Tarazjani J, Borghei SM, Jeng DS. Application of neural networks and fuzzy logic models to long-shore sediment transport. Applied Soft Computing. 2011 Mar 31;11(2):2880-7. Kamphuis JW. Introduction to coastal engineering and management. 2nd ed. World Scientific; 2010. p.273. سلسبی ریچارد. دینامیک ماسه های دریایی. ]سید علی آزرم سا، مترجم[. تهران: انتشارات دانشگاه تربیت مدرس؛ 1381. ص.200. Chau K. A review on the integration of artificial intelligence into coastal modeling. Journal of environmental management. 2006 Jul 31;80(1):47-57. Cipollini P, Corsini G, Diani M, Grasso R. Retrieval of sea water optically active parameters from hyperspectral data by means of generalized radial basis function neural networks. IEEE Transactions on Geoscience and Remote Sensing. 2001 Jul;39(7):1508-24. Ghorbani MA, Khatibi R, Aytek A, Makarynskyy O, Shiri J. Sea water level forecasting using genetic programming and comparing the performance with artificial neural networks. Computers & Geosciences. 2010 May 31;36(5):620-7. Huang W, Murray C, Kraus N, Rosati J. Development of a regional neural network for coastal water level predictions. Ocean Engineering. 2003 Dec 31;30(17):2275-95. Kalra R, Deo MC, Kumar R, Agarwal VK. Artificial neural network to translate offshore satellite wave data to coastal locations. Ocean Engineering. 2005 Nov 30;32(16):1917-32. Lee KH, Mizutani N, Fujii T, Kim DS. Estimation of wave breaking in gravel beach using artificial neural network. In The Nineteenth International Offshore and Polar Engineering Conference; 2009 July 21-26, Osaka, Japan. International Society of Offshore and Polar Engineers; 2009. Liang SX, Li MC, Sun ZC. Prediction models for tidal level including strong meteorologic effects using a neural network. Ocean Engineering. 2008 May 31;35(7):666-75. Makarynska D, Makarynskyy O. Predicting sea-level variations at the Cocos (Keeling) Islands with artificial neural networks. Computers & Geosciences. 2008 Dec 31;34(12):1910-7. Panizzo A, Briganti R. Analysis of wave transmission behind low-crested breakwaters using neural networks. Coastal Engineering. 2007 Sep 30;54(9):643-56. Pape L, Ruessink BG, Wiering MA, Turner IL. Recurrent neural network modeling of nearshore sandbar behavior. Neural Networks. 2007 May 31;20(4):509-18. Teodoro AC, Veloso-Gomes F, Goncalves H. Retrieving TSM concentration from multispectral satellite data by multiple regression and artificial neural networks. IEEE Transactions on Geoscience and Remote Sensing. 2007 May;45(5):1342-50. Yagci O, Mercan DE, Cigizoglu HK, Kabdasli MS. Artificial intelligence methods in breakwater damage ratio estimation. Ocean Engineering. 2005 Dec 31;32(17):2088-106. Yan B, Zhang QH, Wai OW. Prediction of sand ripple geometry under waves using an artificial neural network. Computers & geosciences. 2008 Dec 31; 34(12):1655-64. Bayram A, Larson M, Hanson H. A new formula for the total longshore sediment transport rate. Coastal Engineering. 2007 Sep 30;54(9):700-10. Inman DL. Littoral processes. The sea. 1963;3: 529-33. Singh AK, Deo MC, Kumar VS. Prediction of littoral drift with artificial neural networks. Hydrology and Earth System Sciences Discussions. 2007 Jul 31;4(4):2497-519. Bakhtyar R, Ghaheri A, Yeganeh-Bakhtiary A, Baldock TE. Longshore sediment transport estimation using a fuzzy inference system. Applied Ocean Research. 2008 Oct 31;30(4):273-86. Hashemi MR, Ghadampour Z, Neill SP. Using an artificial neural network to model seasonal changes in beach profiles. Ocean Engineering. 2010 Oct 31;37(14):1345-56. Azamathulla HM, Deo MC, Deolalikar PB. Alternative neural networks to estimate the scour below spillways. Advances in Engineering Software. 2008 Aug 31;39(8):689-98. Kalra R, Deo MC, Kumar R, Agarwal VK. RBF network for spatial mapping of wave heights. Marine Structures. 2005 Mar 31;18(3):289-300. Stuber M, Gemmar P, Greving M. Machine supported development of fuzzy-flood forecast systems. Proceedings of European Conference on Advances in Flood Research. Potsdam Institute for Climae Impact Research (PIK); 2000. p. 504-15. Thomas LJ, Seabergh WC. LEO Littoral Environment Observations. Vicksburg, Mississippi: Coastal Engineering Research Center; 1997 Mar. Kraus NC, Gingerich KJ, Rosati JD. DUCK85 surf zone sand transport experiment. Vicksburg, Mississippi: Coastal Engineering Research Center; 1989 Jun. Kraus NC, Dean JL. Longshore sediment transport rate distributions measured by trap. Proceedings of Coastal Sediments; 1987 May 12-14; New Orleans, Louisiana, United States. New York: American Society of Civil Engineers; 1987. p. 881-96. سرمد زهره، بازرگان عباس، حجازی الهه. روش‌های تحقیق در علوم رفتاری. تهران: نشر آگه؛ 1394. وفاخواه مهدی، شبیه­سازی روان­آب حاصل از ذوب برف به کمک شبکه عصبی مصنوعی، منطق فازی و داده­های اندازه­گیری برف در حوزۀ آبخیز طالقان ]پایان‌نامه[. تهران: دانشگاه تهران ؛ 1387. Anari PL, Darani HS, Nafarzadegan AR. Application of ANN and ANFIS models for estimating total infiltration rate in an arid rangeland ecosystem. Research Journal of Environmental Sciences. 2011 Mar 1;5(3):236. Kişi Ö. River flow forecasting and estimation using different artificial neural network techniques. Hydrology Research. 2008 Feb 1;39(1):27-40. Blaker RS, Norton JP. Efficient investigation of the feasible parameter set for large models. Proceedings of the International Congress on Modelling and Simulation, MODSIM. Modelling and Simulation Society of Australia and New Zealand; 2007. p.1526-32. صادقی­فر طیب، آزرم سا سید علی. تحلیل دانه­بندی و بافت رسوب در حاشیه جنوبی دریای خزر (مطالعۀ موردی: خط ساحلی نور). فصلنامۀ علوم و فناوری دریا. 1394 بهار؛73: 23-36.